THIS IS THE VIEW looking north west from the footpath near Acre Top Road, off Victoria Avenue, Higher Blackley. In the distance we can see the M60 motorway and to the left, Heaton Park. It's Wednesday July 18th 2000, and the UK is enjoying a prolonged spell of long-awaited hot summery weather. People often make comments when they see me taking photographs or riding on my bike. Shortly after I took this photograph, a youth shouted at me from a car "You won't find any nice views round 'ere". Obviously, he wasn't looking. PORTLAND TOWER, formerly the Scottish Widows Fund building, is the headquarters of highly successful property developers Bruntwood. In July 2000, they painted the side of the building yellow and added the Commonwealth Games logo at the top. In the middle, there's a counter showing the number of days till the Games. It's Monday the 17 July 2000, and the number of days left is 738. THE STOCKPORT AIR DISASTER happened early on Sunday the 4th of June 1967. I remember it - my primary school Our Lady's, Edgeley, was only a mile from the crash site, and the next day we talked about it in class, with our teacher Sister Esther. On the 30th anniversary of the disaster, this plaque was put up in memory of the victims who died when the Argonaut came down on corner of Hopes Carr and Waterloo Road (right), less than half a mile south of the town centre. THE RIALTO CINEMA Bury New Road Higher Broughton was demolished in 1999. The site is to be used for a fast food outlet. I must apologise for not photographing this cinema before it was destroyed - I drove past many times intending to take a picture of it, then one day I drove past and it was gone. THE WARNER VILLAGE cinema at Cheshire Oaks, near Ellesmere Port represents the cutting edge of present-day (turn of the millennium) cinema design. I'd call it 'contemporary high tech art deco'. The architects have allowed themselves to be inspired by the designs of the golden age of cinemas - the 20's and 30's. The symmetrical shape, fluted exterior embellishments, gentle curves and pale pastel colours recall the art deco hotels of South Miami Beach. THE MANCHESTER ICE PALACE on Derby Street, Cheetham, was a favourite leisure destination throughout the first half of the 20th century. It's now part of the Lancashire Dairies complex of buildings, but has retained most of its brick and tile facade facing onto Derby Street. THE MANCHESTER ICE PALACE name is still prominent on the exterior of the building on Derby Street, Cheetham. It now belongs to Lancashire Dairies. The tiled exterior is typical of buildings constructed around the turn of the (20th) century. COLLYHURST, north Manchester is seen here from the old footbridge crossing the disused Manchester Victoria to Whitefield and Radcliffe line. 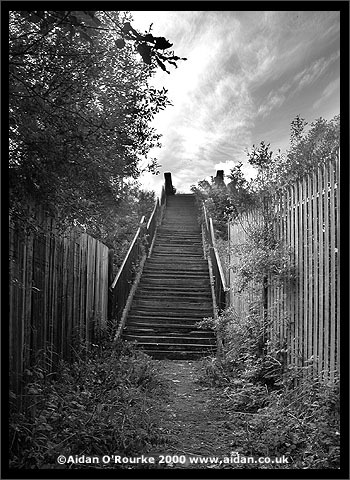 The moody black and white mystery view (right) was taken from the foot of the steps which lead down from the gap between the walls on either side of the bridge (left). HERE'S ANOTHER MYSTERY VIEW taken about half an hour's drive from Manchester. A transport route named after Manchester crosses this scene from one side to the other. Look hard and you'll see a cathedral - which one? The photograph was taken from the top of a hill named after a picturesque village - Can you name it? E-mail info (at) aidan.co.uk.